I recently had the fun opportunity to collaborate with Iryna at nails.edmonton. As you know I usually do my own nails but couldn’t resist having a professional manicure. 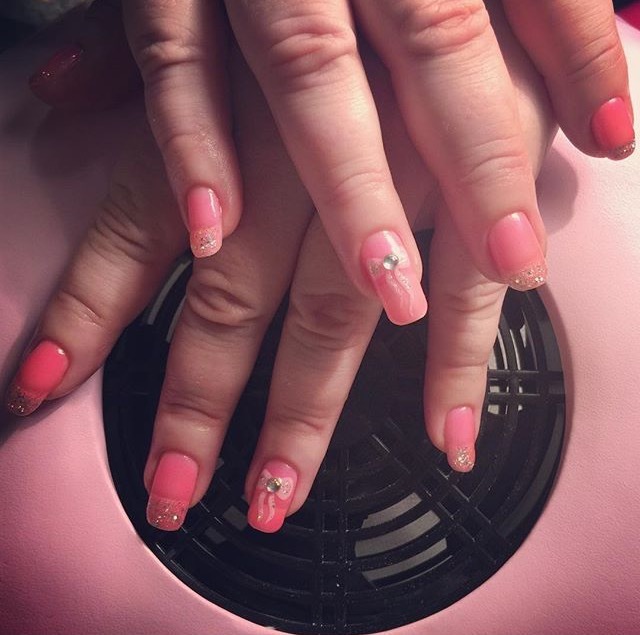 Iryna is a certified mobile nail technician who has a home based business and she will also give manicures to clients in the comfort of their own home (Edmonton and area) – great concept! I went to Iryna’s home for my manicure (I just thought with my cats they would be in the way). She has a comfortable studio set up in the basement. With music playing in the background it was very comfortable and relaxing. She started by removing any old nail polish from the nails. Gently shaping my nails to the desired length and shape (square oval). Next, smooth the surface of the nails with a buffing block (this will also remove yellow stains we all get from wearing too much dark polish!). Now I got to soak my hands for a few minutes, my hands felt silky soft for the rest of the day! 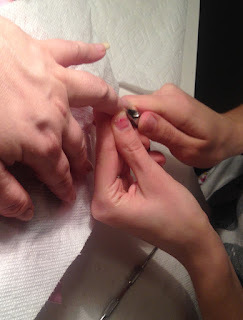 Time to work on the cuticles (I always forget my cuticles…). Iryna came up with a cute bow design to share with my readers! For the nail design Iryna used a Shellac nail polish but it can also be used with regular nail polish as well. She also used a thin nail art brush for the design. - Apply Base Coat to help protect the nails and prevent nail polish from chipping. - Apply a base color. I chose a beautiful Iridescent pink polish. It was very sheer and we needed about 4 coats to make it opaque. - Apply glitter polish to the tips of the nails. - Using a light pink polish, Iryna placed a dot onto the nail where she wanted the bow to be placed. - Make 2 triangles on each side of the bow. Be sure to round the corners. - Apply a couple of swirly lines to the bottom of the bow, this makes cute ribbons. - Using glitter nail polish, make two rounded triangles inside the bow, make thin lines on the swirly ribbons. Neat trick to give definition to the bow! - Add a gem stone to the bow by applying a dot of top coat to the centre of the bow, apply the gem stone. - Using a thin nail art brush, apply top coat around the bottom of Gem Stone to ensure it won’t fall off in a couple hours. - Apply a glossy Top Coat. Its pink, has sparkle and a cute design – just what I like! I love how the Iridescent pink polish slightly changes color depending on the angle or lighting. Using the UV Lamp after each coat really helped the polish dry instantly and I didn’t have to worry about ruining my manicure. Iryna has a very gentle approach and I never had any discomfort. I was very relaxed and was almost falling asleep. It was a very relaxing experience. I definitely will treat myself more often! 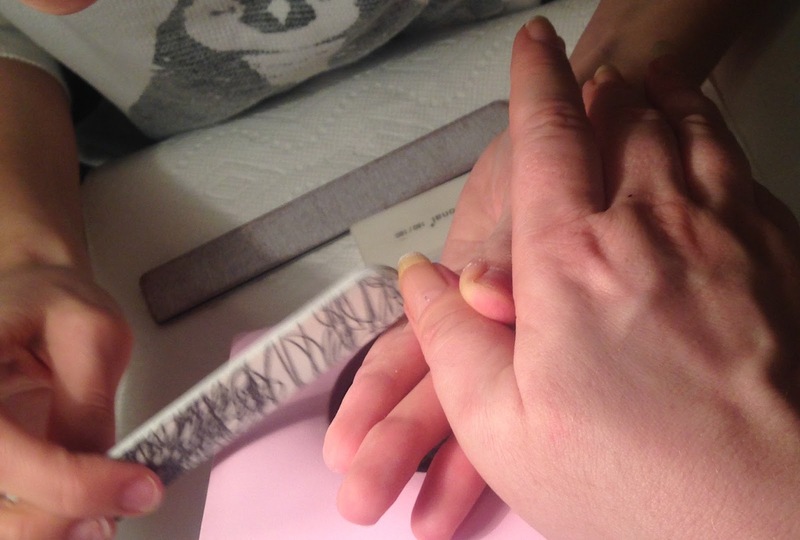 I often wondered with mobile services, how sterile are the tools but was glad to find everything was disinfected by using a disinfectant spray or towelettes – her hands, my hands, nail files, even the dotting tool. The tools like cuticle trimmers/ pushers and nail clippers were sterilized right there in front of me. Iryna ensured me that she will sterilize tools twice after using them and again in front of the client, she will bring the sterilizer with her to client locations. Iryna provides manicures and pedicures – Gel Nails, Nail Polish, Gel Polish, and Shellac Polish. Her prices are extremely reasonable starting at $25, there is a $5 - $10 mobile fee depending on where you live in Edmonton and area. Besides one on one appointments, she will also provide services for “Pamper Parties”, Bachelorette parties, and kid’s parties (your little princess and her friends can have perfect nails for the birthday party)! It was a very wonderful experience and I will be booking Iryna for my next manicure in the near future! If you would like to see more nail art designs by Iryna and nails.edmonton or for contact info, click HERE! !